Since 1973, the Pitcairn Log has been issued regularly by PISG. Initially just an 8 page mimeographed newsletter, the Log is now a professionally-printed 20 page color journal. 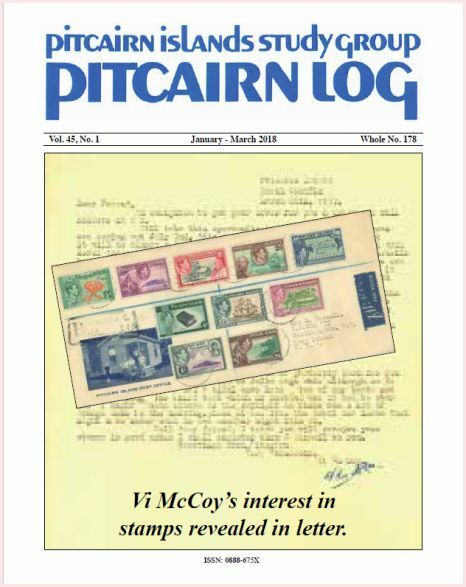 Sent out quarterly to all PISG members, every issue of the Pitcairn Log is profusely illustrated, containing several articles and regular columns that will be of interest to all Pitcairn enthusiasts. Advertising is available at $50 per full page, $25 per half page, and $15 per quarter page per issue, payable in advance. Contact the Pitcairn Log Editor for additional information or to schedule advertising. Inserts are also possible and can be arranged through the Editor. The Pitcairn Log is published in January, April, July and October. Submission deadlines are November 1, February 1, May 1, and August 1, respectively. Note: PISG does not design or modify ads!!! Banner advertising is available at $25 for 3 months on our home page. Ads will appear just above the Welcome message on the home page. All advertising is payable in advance. Submissions must be in Full Banner Ad format (468 X 60 pixels - horizontal only). Contact the Webmaster for additional information or to schedule advertising. Note: PISG does not design or modify ads!! !